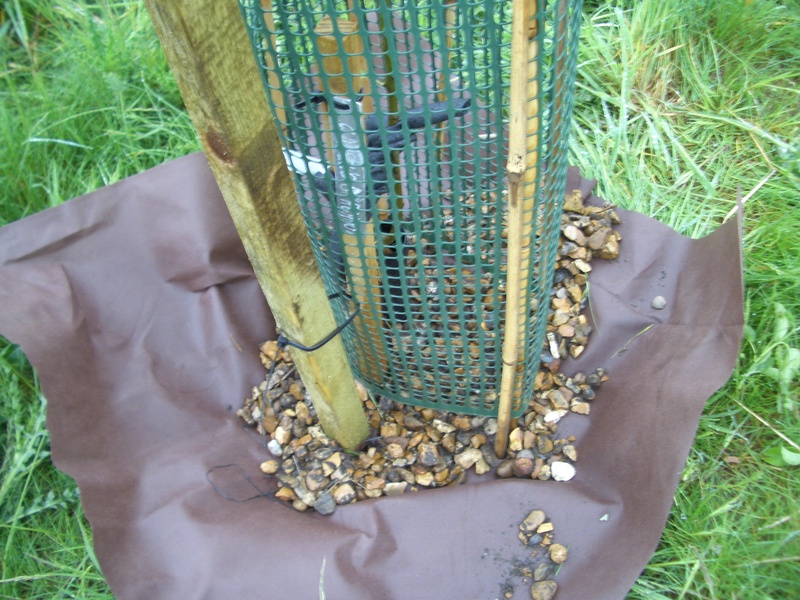 When the ground has warmed up and the soil is moist it is a good time to mulch fruit trees. Mulching of young trees is important if they are to thrive well and it is particularly important for those trees on smaller rootstocks. Grass roots are dense and compete for space, water and nutrients but in addition to this they use up oxygen and produce carbon dioxide leaving the tree roots short of oxygen for respiration and plant growth. So all in all grass roots are very bad news for a young trees – effectively constricting, dehydrating, starving and suffocating them. 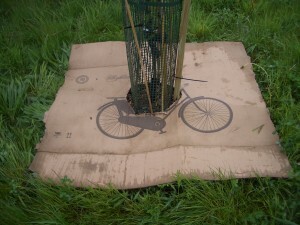 I have mulched the newly planted trees on my land with cardboard and spoiled hay because that was what was available. Hay is likely to have all sorts of seeds in it but as the land around the trees is grown for hay this isn’t a problem for me – unless it turns out to have lots of ragwort seeds in it. 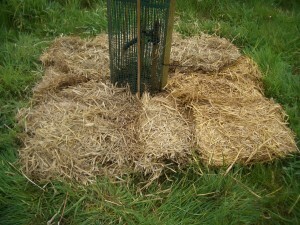 Other materials such as woodchips, straw, manure, leafmould and dried grass clippings could be used. Softwood chips should be left for at least six months, some people recommend two years, before using as they contain organic chemicals such as terpenes which are potentially toxic. Walnut chips should not be used as they also contain a toxic chemical called juglone which I have read that apples are particularly sensitive to, however I have also read that they are not. Because I have large tree guards for protection from deer I have a problem with grass growing within the guard where it is difficult to weed and mulch. To deal with this problem I have used landscape material, one which allows water to pass through, within the guards. 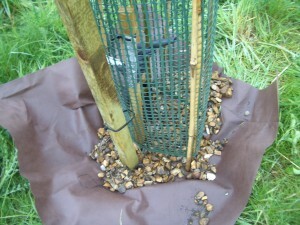 This is held down with gravel and will hopefully keep the base of the trunk clear and dry for several years. 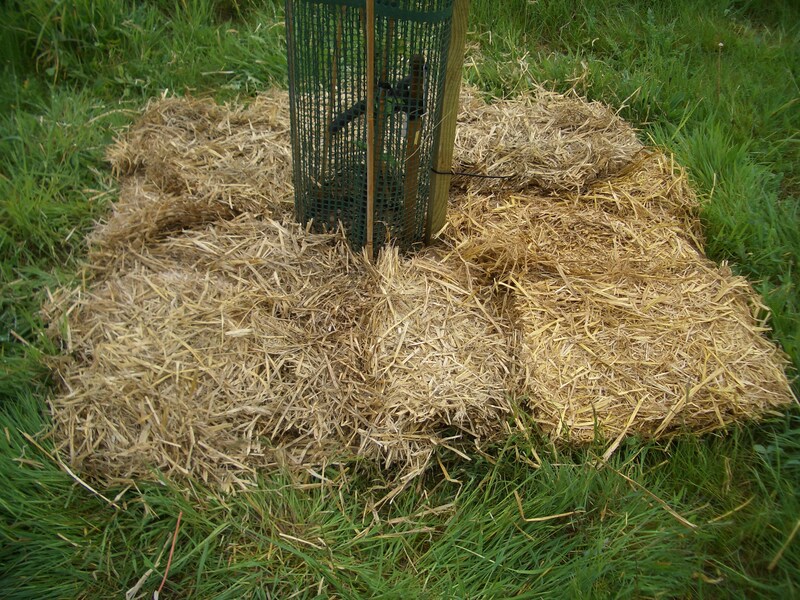 Around this I have laid a thick cardboard surround as a weed barrier and on top of this I have laid the spoiled hay in thick wedges from the bale where possible. This will compost and improve the soil but will require annual renewal. It would be best to water the trees well before mulching and water each layer as it goes on. I don’t have an easy, close water supply but was lucky enough to get the job done between two rainy spells. 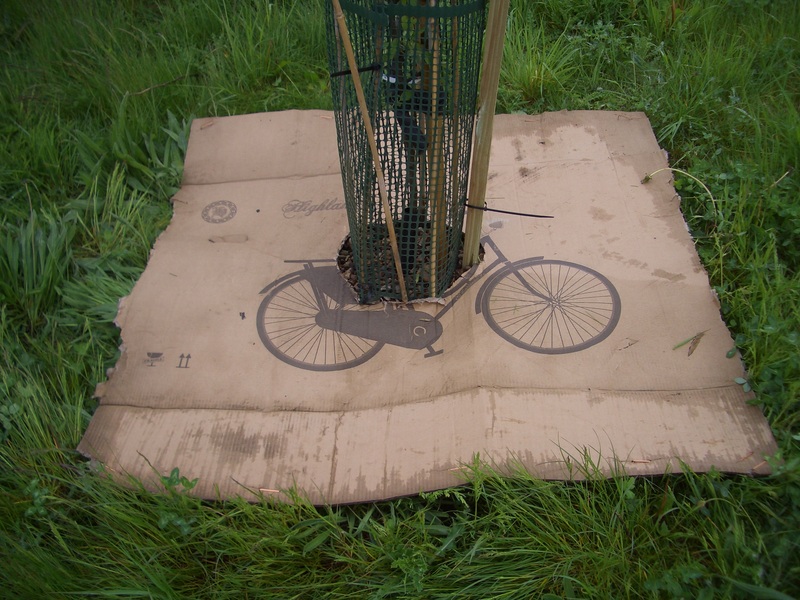 WORKSHOP NOTES onTree Behaviour and Reaction to Pruning (Spur bearing Apple and Pear Trees). Basic Guidelines for Maintenance and Renewal Pruning (Spur Bearing Apple and Pear Trees). Formative pruning (1- 4yrs old) of apple and pear trees. Orchards (4). Planting fruit trees.